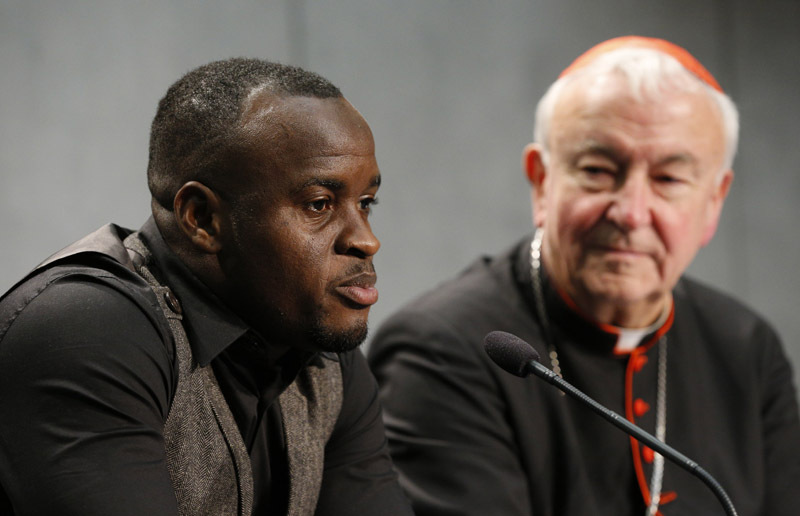 VATICAN CITY (CNS) — An unrelenting, coordinated commitment is needed to prevent people from falling prey to traffickers and to help victims caught in their snares, Pope Francis told representatives of law enforcement agencies and church leaders. The growing number of people being trafficked and exploited are “the most vulnerable” people in society; they are stripped of their dignity, physical and mental integrity and sometimes even their life, the pope said Oct. 27 during an audience with the Santa Marta Group. 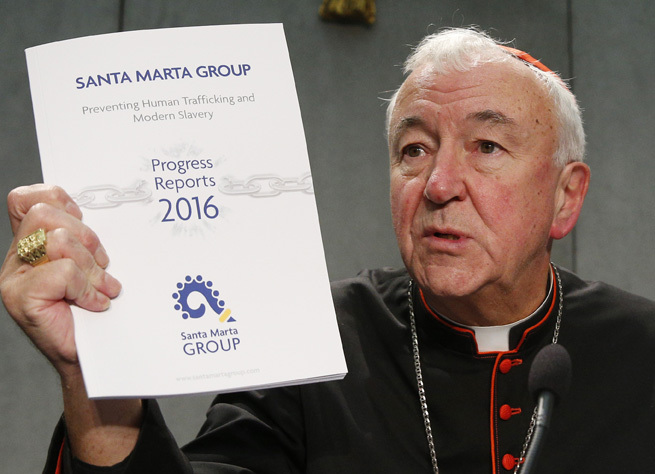 The Santa Marta Group is an international coalition of senior law enforcement chiefs and members of the Catholic Church — including bishops’ conferences and religious orders — working together to end human trafficking. The group was founded in 2014 as part of an initiative begun by the Catholic Bishops’ Conference of England and Wales. The name “Santa Marta” refers to the Vatican guest house, where Pope Francis lives, and where police chiefs and Catholic bishops held their first meeting. The group, which now has members in more than 30 countries, met at the Vatican Oct. 26-27 to detail progress being made, share best practices and update the pope on their efforts. Nearly 21 million people, including minors, are believed to be victims of human trafficking, according to the International Labor Organization. “Voices that were once completely hidden are now being heard and misery that was once unacknowledged is now being acknowledged,” he said at a Vatican news conference Oct. 27. 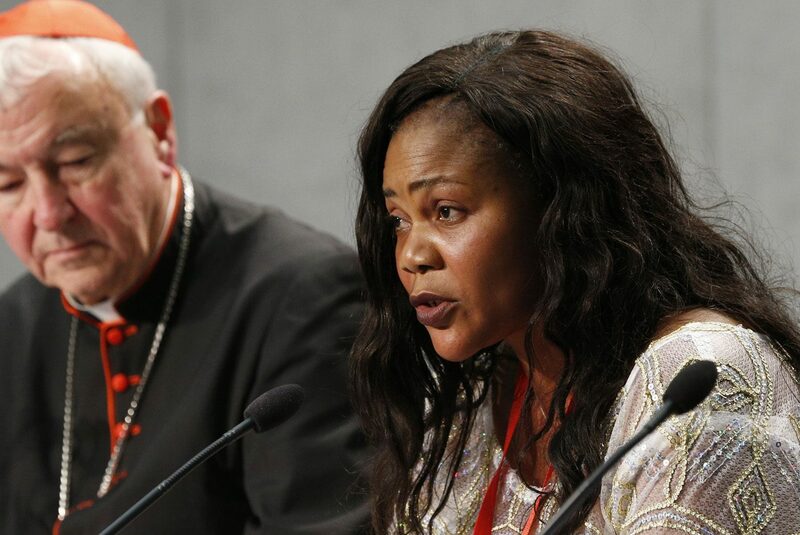 Two survivors of trafficking — Al Bangura and Princess Inyang — also spoke at the conference and detailed how they were tricked by traffickers with promises of legitimate job offers and opportunities. Better prevention also entails giving young people real opportunities by setting up more educational scholarships and skills-building projects in their countries of origin, Inyang told reporters. Law enforcement also needs to do more to investigate, prosecute and arrest traffickers, not the victims, she said. “Reception” or protection shelters should be set up for suspected victims of trafficking instead of housing them in detention centers while their cases are investigated, she added. It’s not always easy for police responding to an incident to clearly identify whether a person breaking the law has been coerced into it by traffickers, said Kevin Hyland, the former detective inspector of Scotland Yard’s trafficking and organized crime unit.